On July 14, 1881, the outlaw known as Billy the Kid was shot and killed by Sheriff Pat Garrett in New Mexico. The Kid was a wild one, having killed at least 8 men and possibly many more (legend says 21) by the time he was 21 years old. The West was called Wild for a reason. Outlaws and rough justice were the way of life and battles between ranchers, rustlers, cattlemen, and robbers were not rare. Here we list 10 of the wildest of the characters that made the West Wild. Who would you add to the list? Named Haskay-bay-nay-natyl, it is no wonder people just called him “Kid.” The Kid worked as an Indian scout for the US Army chasing down other Apaches that were terrorizing white settlers. When at a drunken party the Kid’s father was killed, and the Kid took revenge by killing the perpetrator. When the Kid and his chums surrendered, a soldier got shot in the ankle, perhaps by an Apache or maybe by a white man shooting at the Apaches. The Kid went on the run and again surrendered, this time getting convicted but having his conviction overturned on appeal. The Kid was then rearrested and convicted again, and sentenced to 7 years in jail. He and his buddies escaped, killing a guard in the process. He spent the rest of his life on the run, committing various crimes and robberies but never again getting caught. He became a legend and may have lived into the 1920’s, continuing his raids. Named George Parrot, but also known as George Manuse and George Warden, this guy stuck his big nose where it did not belong, mainly by stealing cattle and robbing people, especially a risky robbery of a money wagon traveling with 15 soldiers and a few other people. Along the way he also managed to kill people, notably a 2 man posse that was after him. After he was caught and then lynched by a mob that stole him from jail, his skin was made into shoes (no kidding!) and his skull was used as an ashtray. Born Crawford Goldsby to a mulatto US Army sergeant and his Cherokee wife in 1876, this desperado only made it to age 20 before being hanged. At his hanging he was asked if he had any last words, to which he famously replied,“I came here to die, not make a speech.” During his short career of crime he and his pardners robbed stagecoaches, banks and stores, and shot anyone that resisted. He probably killed at least 7 men himself. 7. Butch Cassidy and the Sundance Kid. Robert LeRoy Parker and Harry Longabaugh assumed an alias as do many Wild West characters, and they formed The Wild Bunch robbery gang. Robbing banks and trains they eventually fled to Bolivia where they are believed to have been killed in a shoot out with Bolivian Army troops in 1908. A famous movie starring Paul Newman and Robert Redford was made about them in 1969, called appropriately, Butch Cassiday and The Sundance Kid. Born with the less intimidating name of Martha Jane Canary, Jane was a rough and tumble character known for “Indian” fighting” (Native-Americans) and being a friend of Wild Bill Hickock. Although Jane worked the dangerous job of frontier scout and was part of the Deadwood, S. Dakota crowd at its wildest, she was well known for her acts of kindness in caring for sick and injured people, or those just down and out. Jane died at about age 51-55 (history is not sure) of an illness while aboard a train in S. Dakota. Her lifelong alcoholism may have contributed to her death. Jane had also appeared in Buffalo Bill’s Wild West Show, but only to tell harrowing tales of her experiences. She is buried next to Wild Bill Hickock. Jane was played in movies by Jean Arthur, Jane Russell, Doris Day, Yvonne De Carlo (aka Lily Munster), Ellen Barkin, Stephanie Powers and Anjelica Huston among others. Unlike most hard living men of the Wild West, Wyatt lived almost to 81 years old. Famous for the Gunfight at OK Corral, Earp was a gambler, lawman, buffalo hunter and vigilante who mercilessly ran down the killers of his brothers. 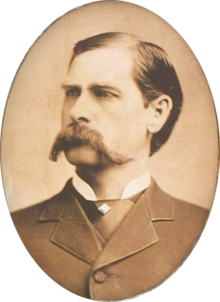 His famous buddy, Doc Holliday, was also a known gambler and gunman. Earp actually consulted on Hollywood movies in the 1920’s. Many books and movies have been made about Earp, especially regarding his most famous gunfight. Probably the most famous bank and train robber of his day, James and his brother, Frank, were bitter about the Civil War and continued their raiding ways after the war was over. One of the most wanted men in the world, James was assassinated by a punk that shot him in his own house, taken by surprise. Kind of a Robin Hood character, James endeared himself by sharing his loot with poor (white) people, making it hard for law enforcement to get information of his whereabouts. Born Henry McCarty, Jr and also going by William Bonney, The Kid killed his first man at age 18 and the rest of his short life was violent, with many other men falling to his guns. A participant in the Lincoln County War (between competing businessmen), the Kid’s first job in New Mexico was in a cheese factory! He became famous when the Governor of New Mexico, Lew Wallace (former Union Civil War general and the author of Ben Hur) put a price on his head. Having twice escaped from jail, the Kid was gunned down in a dark room by Pat Garrett who had sneaked in to arrest him. Hardin was perhaps the most famous gunslinger of the Wild West, killing somewhere between 42 and 27 men along the way. He helped form his own legend by writing a book about his exploits. When he killed his first man at age 15, he ambushed a posse coming after him, killing 4 more. Hardin also had a famous incident where he fired several shots through a wall to quiet the loud snoring that was coming from the other room, killing a man in the process. He became notorious for “killing a man for snoring.” Hardin was killed at age 42 when a man he had argued with earlier walked up behind him in a saloon and shot Hardin in the back of the head, and then shot him 3 more times as he lay on the floor. You can also watch a video version of this list on YouTube. Next Article History: July 14, 1933: Nazi’s Begin Eugenics Program; Evil or Common Sense?